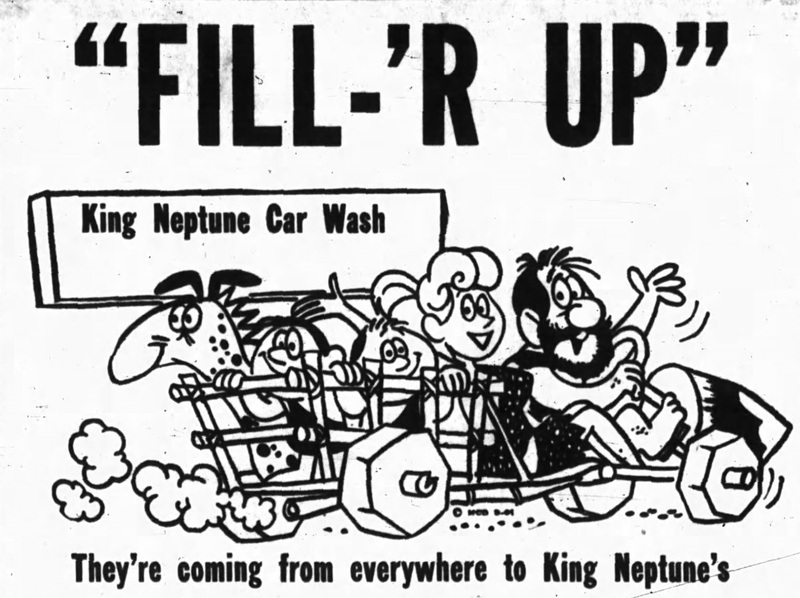 From the bottom of the sea, Neptune settled on Carling Avenue in 1959 in order to ensure that Ottawa’s cars were spotless. If only that neon was still with us. Source: Ted Grant / LAC, Accession 1981-181 NPC, Series 388, Item 1 (March 11, 1959). Carling Avenue between Westgate and Carlingwood is a highly interesting part of town to me. Perhaps more so than any other part of town, the built city in the area serves as a great illustration of postwar development. I’ve written about the northwest corner of Carling and Cole before, but because I hadn’t written about the opposite corner, I missed out on the subject of this story. With the seemingly endless waves of suburban development, Ottawans needed somewhere more thorough and convenient (to say nothing of winter logistics) than their driveways to ensure their Fairlanes, Super 88s, and Impalas glistened on the Sunday drive. Glistening for that Sunday drive was one element. Rusting out to nothing at all during the winter was also a concern lest you be left with some kind of Bondo barge. Source: Ottawa Journal, January 18, 1960, Page 15. 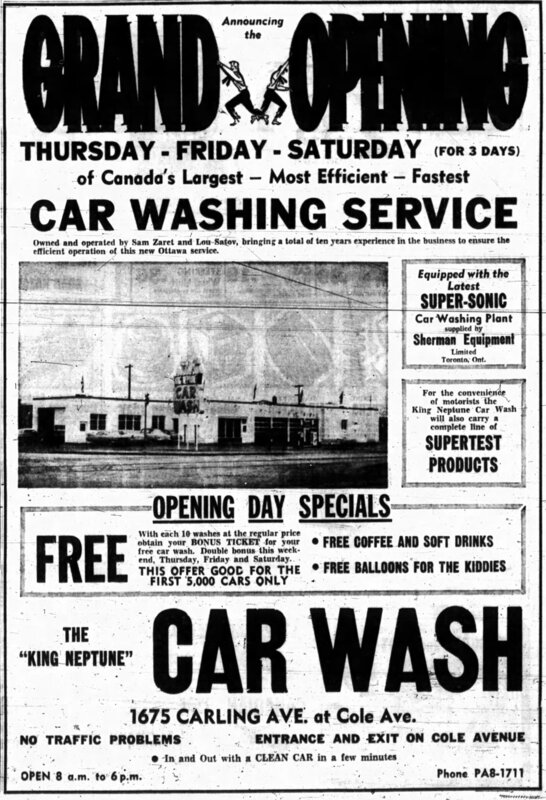 The King Neptune Car Wash was the fifth “automatic” car wash in Ottawa-Hull, and the first in the west end. Though the service of car washing had long been available at gas stations around the city, it was done manually and there much a much longer, and considerably more labourious process. With the introduction of automatic (both fully and semi) processes following the war, the time required shrunk considerably. This was, of course, the motivator behind the naming of the first four: Minute (on Catherine, 1952)1Ottawa Journal, July 11, 1952, Page 18, Jiffy (on Rideau, 1953)2Ottawa Journal, September 17, 1953, Page 31., Supersonic (on Maisonneuve in Hull, 1956)3Ottawa Journal, May 11, 1956, Page 30., and Speed-O-Matic (on Montreal Road, Eastview, 1956).4Ottawa Journal, January 14, 1963, Page 46. As a sidenote, the Labrie family’s Speed-o-Matic enterprise is endlessly fascinating. In addition to the car wash, garage, and pumps, it also played host to a sporting goods store, dabbled in boat sales, and even had an automat lunch. They were also one of the businesses who signed on to the very early Ottawa-based credit card service, Master Credit Services (MCS). As the west end began to fill in, so too did the services. Source: Ottawa Journal, November 5, 1959, Page 15. Hardly the product of Roman5Poseidon in Greek. Wikipedia has a fun list of water-related deities. 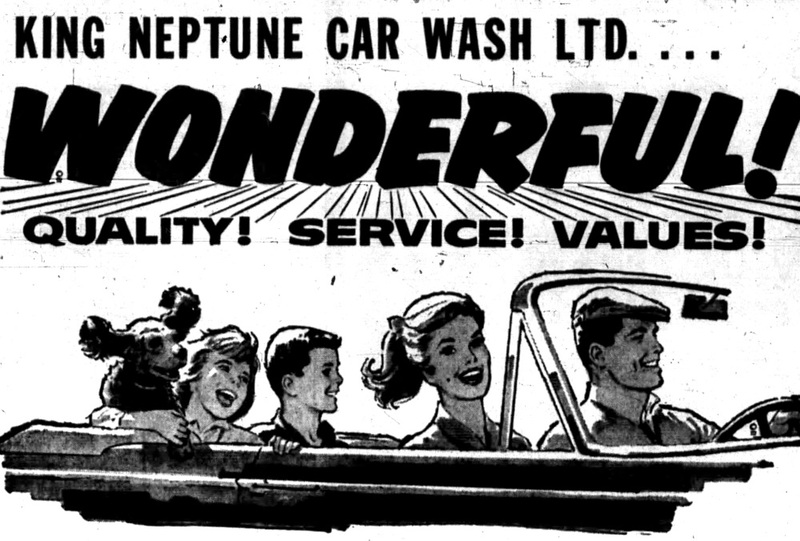 mythology, the King Neptune Car Wash was the venture of Sam Zaret(sky)6He shortened his family name from Zaretsky and Zaret in 1957. See Ottawa Journal, October 24, 1957, Page 45. and his brother-in-law Lou Satov.7Advertisement, Ottawa Journal, November 5, 1959, p. 15; Lou Satov was the husband of Zaret’s sister Sarah. See Ottawa Journal, January 7, 1946, Page 11 and January 12, 1948, Page 12. Already involved in Ottawa’s highly popular stock car races, the duo secured a loan from the Industrial Development Bank (now Business Development Bank) and got their plan of city streets populated by shinier chrome off the ground.8This wasn’t entirely without controversy. An unnamed reader of R(obert).U. Mahaffy’s business column in the Ottawa Journal reportedly inquired about how they received an IDB loan when the program did not cover fuel sales. When asked, Zaret responded that they “didn’t have gas” when they opened and the loan was made to the cleaning business. Of course, in the publicity shot above, there is a “Grand Opening” banner hung between two pumps. They may have been inactive, however, as they promised that Supertest will be carried. See R.U. Mahaffy, “Business,” Ottawa Journal, June 10, 1961, Page 39. Have a business question? R.U. Mahaffy is on the case! Source: Ottawa Journal, June 10, 1961, Page 39. Though neither were major public figures, Satov’s partnership appears to have been somewhat silent relative to Zaret, who was an active member of the Westboro Kiwanis Club9Zaret showed up frequently in the Journal’s reporting about the activities of the service club. and a director of the Automatic Car Wash Association.10”Ottawan Named,” Ottawa Citizen, July 26, 1962, Page 8. When coin operated self-serve commercial car wash facilities came around during the late 1960s, they were not affected by the Sunday-closing laws. In the late fall of 1968, Zaret along with two other car wash owners staged a protest by opening on a Sunday and daring the city to enforce the law.11”Force Issue: Car Washes Open Sunday – Break Law,” Ottawa Journal, November 4, 1968, Page 36. Zaret came by this fiery streak honestly. His father, Chaim Zaretsky, was a fruit dealer based on Bank Street and often enough ran afoul certain bylaws, such as exposing produce on Bank street and opening after 7PM. See “Thirteen Fined in Traffic Court,” Ottawa Journal, June 5, 1930, Page 24; “Open After 7 O’Clock,” Ottawa Journal, December 11, 1936, Page 18. Wonderful! Quality! Service! Values! Should probably get that roof up before going through though. Source: Ottawa Journal, April 22, 1963, Page 15. Their advertising was often quite whimsical and occasionally made somewhat obvious (yet safe) references to popular television. With a brand that departed from the speed-related norm of its competitors, it may have been expected. I don’t think there’s anything about this that’s not of its time. Source: Ottawa Journal, June 25, 1961, Page 13. By 1973, Neptune was ready to return to his kingdom beneath the waves. Advertising for the business ceased entirely, and it seems that Zaret decided in the face of stagflation (and perhaps health12Dave Brown reported in 1967 that Zaret was at the “Civic for tests and an overhaul…” See Dave Brown, “Below the Hill,” Ottawa Journal, March 6, 1967, Page 21.) to take his retirement. King Neptune was no longer listed in the 1975 edition of Ottawa City Directory. The Ming Auto Beauty Centre, which had been opened on site around 1972, took over the space13Though Ming appears to be a name, it actually stands for “Masters In Natural Glazing”. A Budget Rent-a-Car had also been on site for some time and seems to have remained until the closure of Ming. vacated by the god of the sea. Zaret passed away shortly after, in 1976, at the young age of 52.14Obituary for Samuel Zaret, Ottawa Journal, June 21, 1976, Page 33. 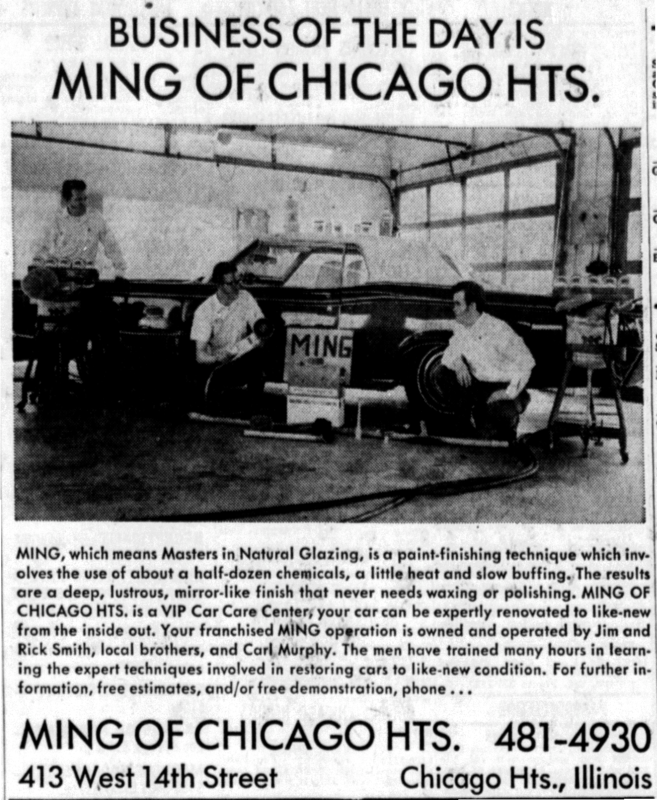 An advertisement for Ming Auto Beauty. Source: Ottawa Citizen, February 13, 1984, Page 33. Ming Auto Beauty Centre was storied in its own right. 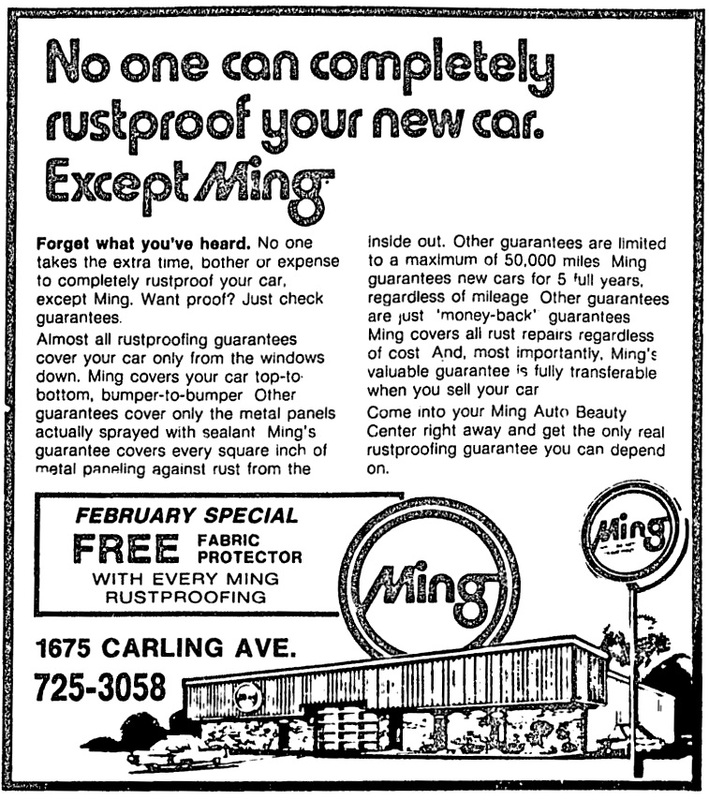 For those Ottawans who didn’t heed the warning from the advertising above about rusting out (and going all Flintstone, Ming made a name for itself in preserving and restoring auto bodies. It was billed as a system to protect without the use of – or need for – wax. A Ming Ad from another city. Source: Cleveland-Homewood-Flossmoor Star, May 23, 1971, Page 21. When it comes to quality in retail, however, Ming’s generous guarantees may have come at a cost and the chain quickly got itself into trouble. Ming International had gone bankrupt by 1993 and a number of Canadian outlets were managed out of Ming America’s Salt Lake City, UT headquarters. A story in the Citizen from that year highlighted that guarantees made during the 1980s were something of a burden to the operation.15Tony Cote (1993). “Long-Awaited Repairs Take Rust out of Relationship,” Ottawa Citizen, September 1, 1993, Page B4. It was around that time that the original building was demolished, the current strip mall constructed, and the address of 1675 Carling was taken over by Norwalk, The Furniture Idea, now home to Luxe Interiors. 2. ↥ Ottawa Journal, September 17, 1953, Page 31. 3. ↥ Ottawa Journal, May 11, 1956, Page 30. 4. ↥ Ottawa Journal, January 14, 1963, Page 46. As a sidenote, the Labrie family’s Speed-o-Matic enterprise is endlessly fascinating. In addition to the car wash, garage, and pumps, it also played host to a sporting goods store, dabbled in boat sales, and even had an automat lunch. They were also one of the businesses who signed on to the very early Ottawa-based credit card service, Master Credit Services (MCS). 5. ↥ Poseidon in Greek. Wikipedia has a fun list of water-related deities. 6. ↥ He shortened his family name from Zaretsky and Zaret in 1957. See Ottawa Journal, October 24, 1957, Page 45. 7. ↥ Advertisement, Ottawa Journal, November 5, 1959, p. 15; Lou Satov was the husband of Zaret’s sister Sarah. See Ottawa Journal, January 7, 1946, Page 11 and January 12, 1948, Page 12. 8. ↥ This wasn’t entirely without controversy. An unnamed reader of R(obert).U. Mahaffy’s business column in the Ottawa Journal reportedly inquired about how they received an IDB loan when the program did not cover fuel sales. When asked, Zaret responded that they “didn’t have gas” when they opened and the loan was made to the cleaning business. Of course, in the publicity shot above, there is a “Grand Opening” banner hung between two pumps. They may have been inactive, however, as they promised that Supertest will be carried. See R.U. Mahaffy, “Business,” Ottawa Journal, June 10, 1961, Page 39. 9. ↥ Zaret showed up frequently in the Journal’s reporting about the activities of the service club. 10. ↥ ”Ottawan Named,” Ottawa Citizen, July 26, 1962, Page 8. 11. 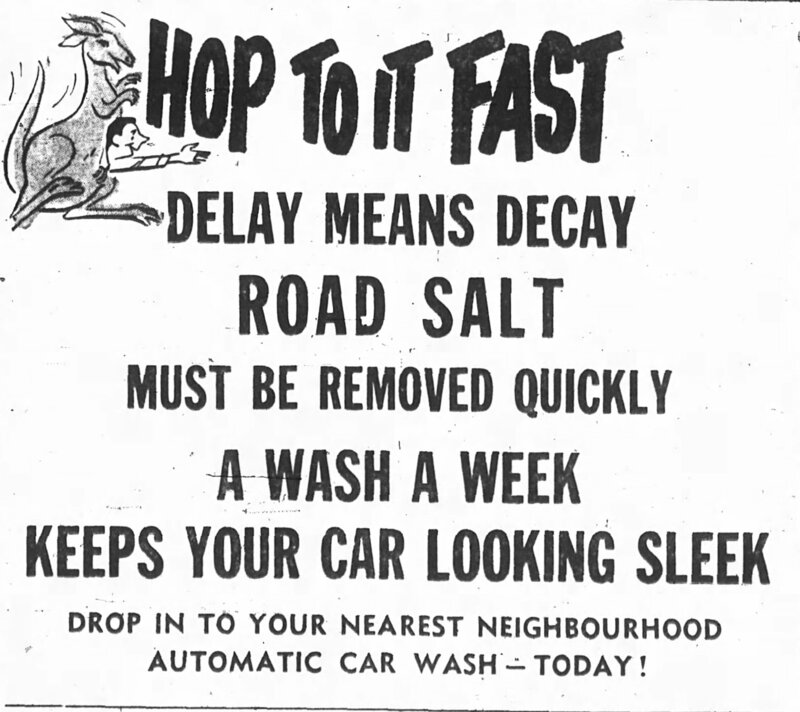 ↥ ”Force Issue: Car Washes Open Sunday – Break Law,” Ottawa Journal, November 4, 1968, Page 36. Zaret came by this fiery streak honestly. His father, Chaim Zaretsky, was a fruit dealer based on Bank Street and often enough ran afoul certain bylaws, such as exposing produce on Bank street and opening after 7PM. See “Thirteen Fined in Traffic Court,” Ottawa Journal, June 5, 1930, Page 24; “Open After 7 O’Clock,” Ottawa Journal, December 11, 1936, Page 18. 12. ↥ Dave Brown reported in 1967 that Zaret was at the “Civic for tests and an overhaul…” See Dave Brown, “Below the Hill,” Ottawa Journal, March 6, 1967, Page 21. 13. ↥ Though Ming appears to be a name, it actually stands for “Masters In Natural Glazing”. A Budget Rent-a-Car had also been on site for some time and seems to have remained until the closure of Ming. 14. ↥ Obituary for Samuel Zaret, Ottawa Journal, June 21, 1976, Page 33. 15. ↥ Tony Cote (1993). “Long-Awaited Repairs Take Rust out of Relationship,” Ottawa Citizen, September 1, 1993, Page B4. Thanks for the article. Interesting as always! Thanks Leona! My eventual goal is to have all of Carling covered. 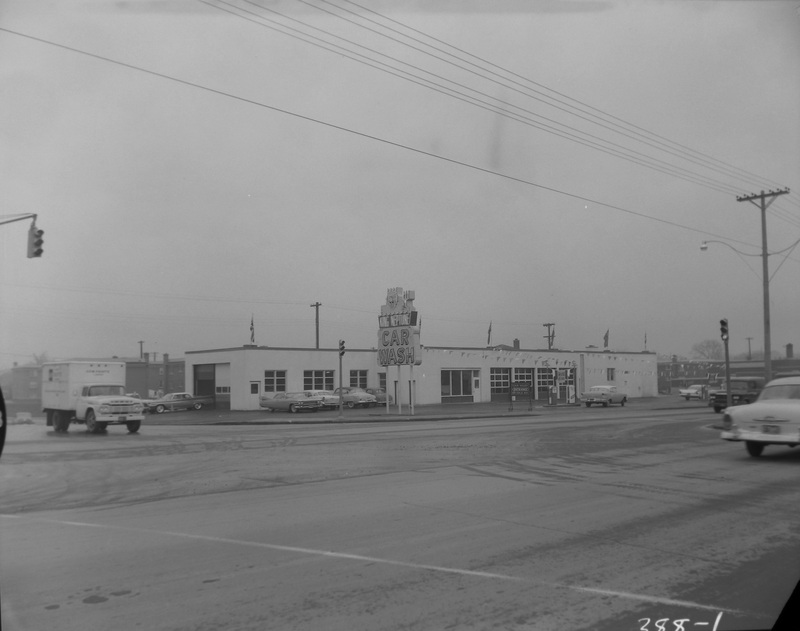 In 1961-62, I worked part-time at the Texaco station at Carling & Sherbourne. When customers left their car to be washed, I would be sent down to King Neptune with the car and a pre-paid wash ticket to have to washed there. I can also recall the stock-car King Neptune sponsored.racing at Capital City Speedway, driven by a fellow from Leitrim. He was nick-named the Flying Farmer. Thank-you so much for sharing those memories! Sounds like an interesting system to work on. I like the idea of that nickname too, the Flying Farmer.